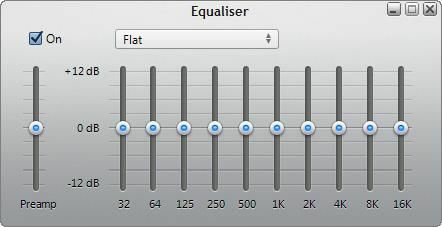 Just like physical graphic equalizers that you might find on consumer electronics (like home stereos), the equalizer tool in iTunes 11 allows you to shape the audio you hear in order to improve sound quality. Using the built-in multi-band equalizer you can either boost or reduce certain frequency ranges in order to get the exact audio response you need through your speakers. In a way, think of the equalizer tool as an audio filter that lets you choose how much of each frequency band you let through to your speakers. You'll also find this technique useful for listening to your digital music in different rooms -- each place in your home behaves differently due to acoustic variations. While listening to the songs in your iTunes library you might already have found that there's a lack of audio detail (or a big difference) between your desktop speakers and other devices -- such as a Hi-Fi system or portables like the iPhone, iPod, etc. If this is the case then all you might need to do in order to gain a similar level of detail is to balance these frequency bands to suit your desktop speakers. Just to note, this process of audio equalizing shouldn't be confused with another audio enhancement tool in iTunes called Sound Check -- this normalizes the loudness of songs so they all play at the same volume level. If you want to optimize your desktop speakers to get the maximum detail from your iTunes songs, then this tutorial will show you all the things you can do with the equalizer tool in iTunes. As well as using the presets that are already built into it, we'll also highlight how to create your own set of customized settings to get the full benefit out of your listening environment. From the iTunes main screen, click the View menu tab at the top of the screen. If you don't see this menu then you'll need to enable it by holding down the [CTRL] key and pressing B. If you can't see this main menu at the top of the screen, then hold down the [CTRL] key and press [M] to enable it. Click the Show Equalizer option. Alternatively, hold down the [CTRL]+[Shift] keys and then press 2. The equalizer tool should now be displayed on the screen and enabled (on) by default. If it isn't enabled, then click the checkbox next to the On option. On the main screen of iTunes, click Window and then iTunes Equalizer. To do the same thing using the keyboard, hold down the [Option]+[Command] keys and then press 2. Once the equalizer is displayed ensure that it is enabled (on) -- if not, click the box next to On. Before going to the trouble of creating your own custom EQ setting you may find that one of the built-in presets will do just fine. There's a good selection of different presets such as Dance, Electronic, Hip-Hop to more specific ones like Small Speakers, Spoken Word, and Vocal Booster. Click the Up/down arrow in the rectangular box to display the list of EQ presets. Choose one by clicking on it. You will now see that the multi-band equalizer will change its slider settings automatically and that the name of your chosen preset will be displayed. If after playing one of your songs you want to try another preset, then just repeat the above steps. Start by playing a track or playlist from your iTunes library so that you can hear what happens to the sound when you start changing the equalizer settings. Modify each frequency band by moving each of the slider controls up and down. Don't worry about changing any of the built-in presets at this stage -- nothing will be overwritten. Once you are happy with the overall sound, click the Up/down arrow in the rectangular box as before, but this time, choose the Make Preset option. Type in a name for your custom preset and then click OK.
You'll now see the name of your custom-made preset is displayed on-screen and it will also appear in the list of presets too.